Things have been busy in Tamale World, lots to do so little time. I almost wish for a longer day, maybe 34 hours instead of 24 hours to get it all done. Many of you already know that I am very community and small business minded and I LOVE doing events that allow for my different passions to overlap. Oakland Events is a new event production company founded by Helen Wyman. She has years of experience working in some of Oakland shopping districts helping merchants. She started her full scale event production company to take outdoor festivals and special events to a new level. Helen's goal is to produce local, sustainable events to highlight all facets of Oakland commerce but especially the small independent business and artist. Why do I know so much about this company? Helen and I are both members of the marketing committee for the Oakland Merchants' Leadership Forum (OMLF). I also created my restaurant's food booth, Tamale Girl, to primarily participate in Oakland Events' productions. The full disclaimer, my Partner in Crime and Volunteering, Consuelo Jacobs, is the Director of Operations and Exhibitor Coordinator for this company as well as a member of the OMLF marketing committee too. There are still a couple of outdoor events produced by OE in the weeks ahead. Instead of selling food, I'm going to be coordinating a voter registration booth since the deadline for California is October 20, 2008 for the Presidential election. Want to volunteer to staff at my booth? Drop me line at tamaleworld@gmail.com. Here's some cut n' pastes for the Oakland Events website for more info! 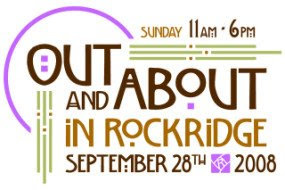 The annual Rockridge Out & About festival, held on College Avenue, highlights local businesses as well as live music and dance, alternative health exhibitors, artisan and community booths, cooking demonstrations and food booths presented by Rockridge restaurants. Five stages will feature well-known Bay Area musicians and performers including a DJ / Dance Stage and Rockridge Runway Fashion with attire selected by local boutiques, plus a Chef Stage featuring the district’s top chefs, art installations and Tots’ Town with rides, games, prizes and more will make this a great family day. Sunday, Sept. 28 11 a.m. – 6 pm. 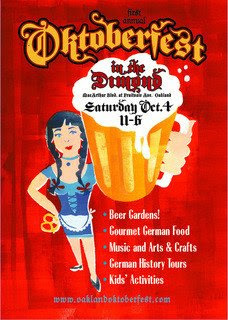 Although Oakland’s Dimond District is a diverse and progressive neighborhood, it is steeped in German history. Around 1900, the area was largely a German community where social and community life centered on the beer gardens in the area. Though the beer gardens are gone, the community spirit they fostered still remains. Oktoberfest will feature traditional German beer gardens, German food and dance, gourmet food booths, historical tours, performances by local artists on two stages, artisans, a kids’ carnival area, a green living and wellness expo, and much more. Attendees will quaff, sip, drink, tipple, imbibe, dance, sing, and eat, as well as learn about the historical connection between Oakland and its earlier German residents.